Are prenatal vitamins really just for pregnant women? 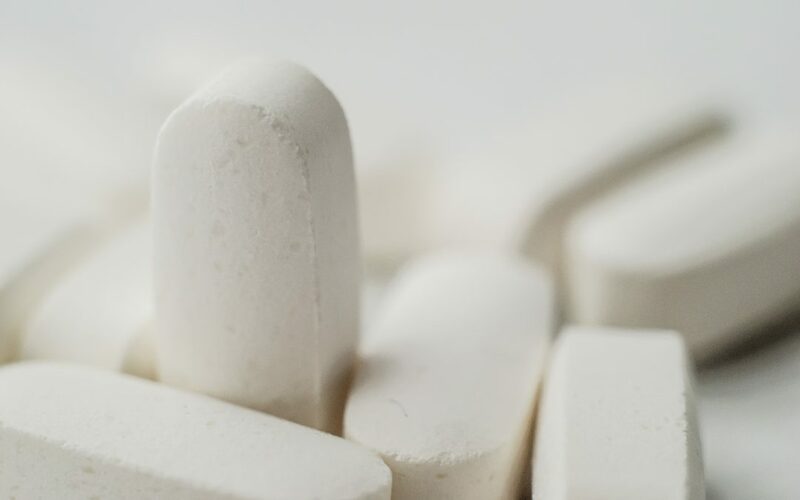 We covered the reasons why starting 3 months before conception is ideal in this post, and how to select your prenatal multivitamins here. The foundation of your babys’ spinal cord and brain happens before you even see the little + sign on the pregnancy test. 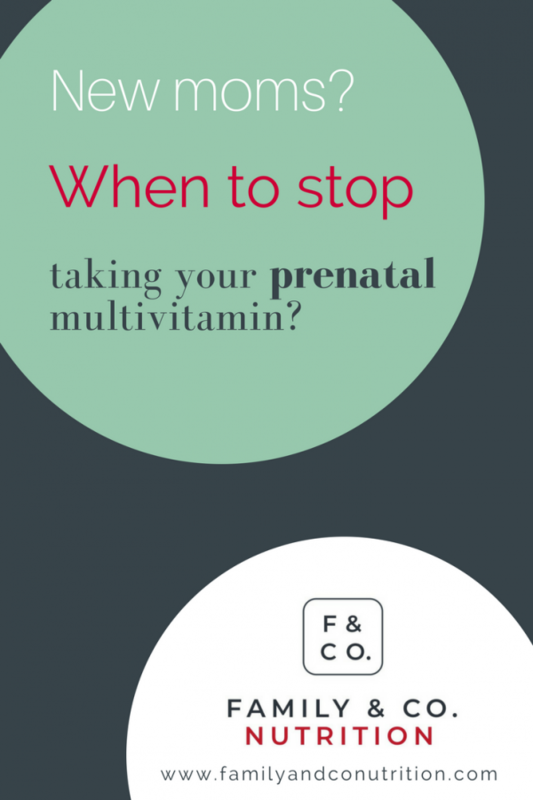 Taking a prenatal multivitamin is recommended to provide sufficient folic acid and iron. It doesn’t replace a healthy and balanced diet; it complements it. 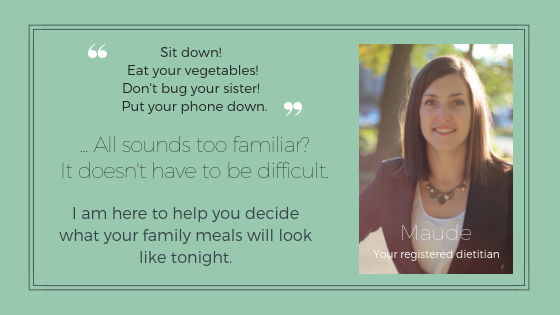 In an ideal world, the decision to start a family would come with a professional assessment of your family nutrition habits. It’s the perfect time to make healthy food choices and create new family traditions to be happy and healthy…. but it’s also the most challenging time to make any changes! Like you need to add more to your list! For some families, it is the motivation to make changes. For others, it’s not the right moment. Both are okay. Don’t force anything on your family, be honest with yourself and be kind towards your feelings. A prenatal vitamin before conception ensure you have all the nutrients you need to welcome this little miracle! We suggest to take a daily prenatal multivitamin for the duration of your pregnancy. Try various brands: fruity gummies, chewable tablet, big or small pills, a daily dose of 1, 2 or 3 pills as per the bottle’s indication… there are lots of choices and maybe something will suit you better. If you have morning sickness and throw up a lot, take your prenatal multivitamin after dinner or even at night. Take your prenatal multivitamin with food, so it doesn’t sit on an empty stomach. Do you eat enough fibres? Take a look at your meal and at your lunch box: what does it contain? Can you add 1 item that will bring more fibres? Do you move your body enough? Walk, bike, swim, play badminton, do yoga… anything that you enjoy! Chose activities that don’t put too much stress on your body: not the time to go horseback riding or do karate. Get moving. Everything counts! A 5 minutes walk to the furthest washroom (I bet you are visiting the washrooms often! ), a bike ride around the block, vacuuming the house, working in your garden…it doesn’t have to be a formal workout at the gym if that is not enjoyable for you. Take your prenatal multivitamin during your whole pregnancy. If you experience discomfort, switch brands, try to take it at night or with food. 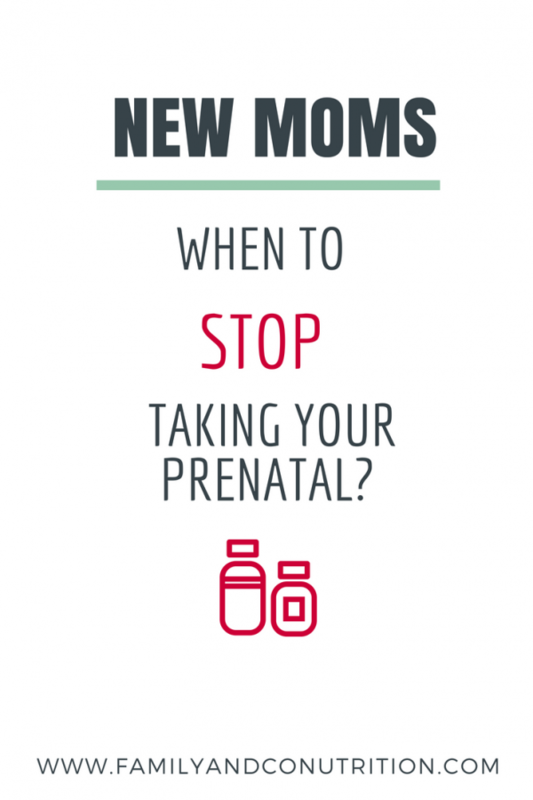 Want a list of the most popular prenatal vitamins on the market? Subscribe to get your copy of this handy table we’ve prepared for you. You’ll be able to compare and choose the best one for you! Continuing taking a prenatal multivitamin ensures that you are not lacking any nutrients that are important for your recovery and for baby’s growth. It provides iron that are essential for you during the post-partum weeks. You might have lost a lot of blood during and after the delivery, so you will need adequate intake to replenish your stock. The first few weeks after your baby’s birth are Rock’n’Roll. You are barely sleeping, probably not cooking a lot… because you are simply too busy being tired and being in aww towards your baby. Do you eat as well as you use to, or would hope for? Maybe not, and that is okay. Your attention and efforts are going towards your baby’s needs. For the time being and until you get back on your feet, the prenatal multivitamin is complementing your diet. 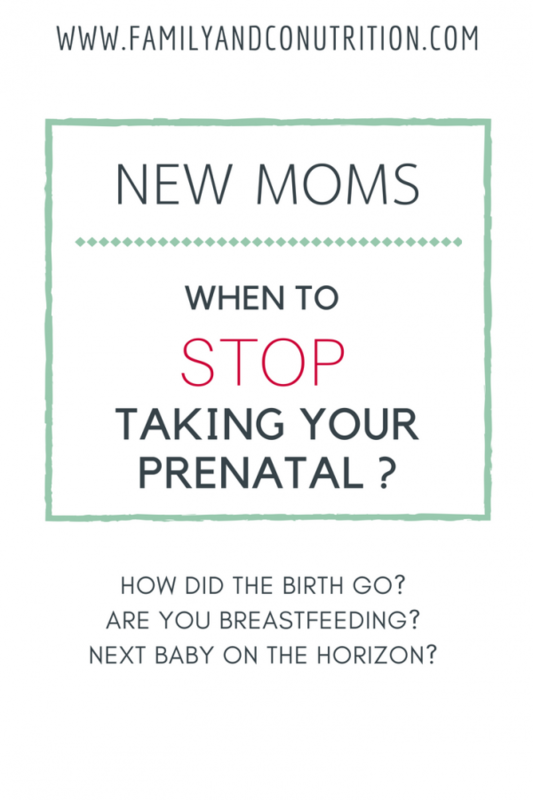 Continue taking your prenatal multivitamin in early postpartum as you need to recover from birth. Although you are not growing a baby inside anymore, you are kinda growing a baby outside. Breastmilk nutrient content is highly depending on your food intake and general diet. Lactating women have increased nutrient needs compare to non-lactating women. 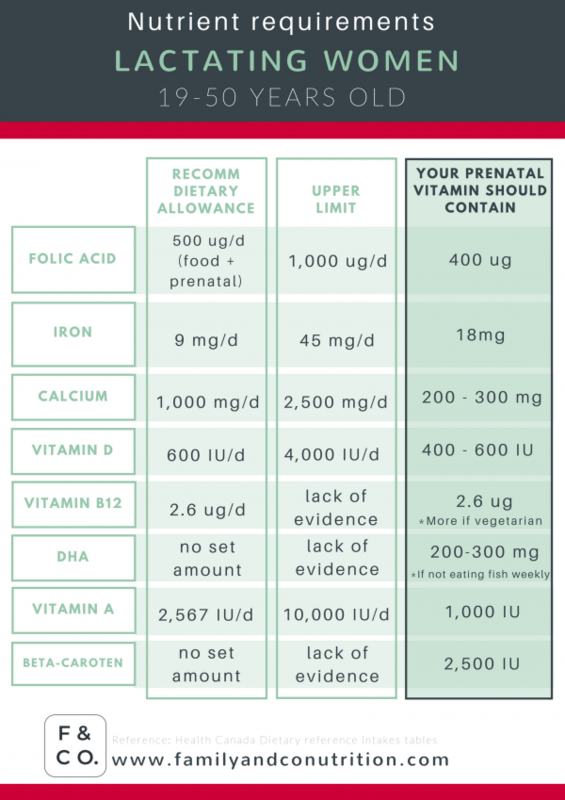 Your needs for folic acid and iron are not quite as high as during pregnancy, but your overall needs are still high. Once you got your routine back on track, hopefully you are able to eat a balanced and healthy diet. That is the first step. The prenatal multivitamin, again, act as a safety net so you don’t lack any nutrients important for your baby’s growth. Breastfeeding mothers have increased nutrients needs to ensure their baby receives all the nutrients needed to grow. 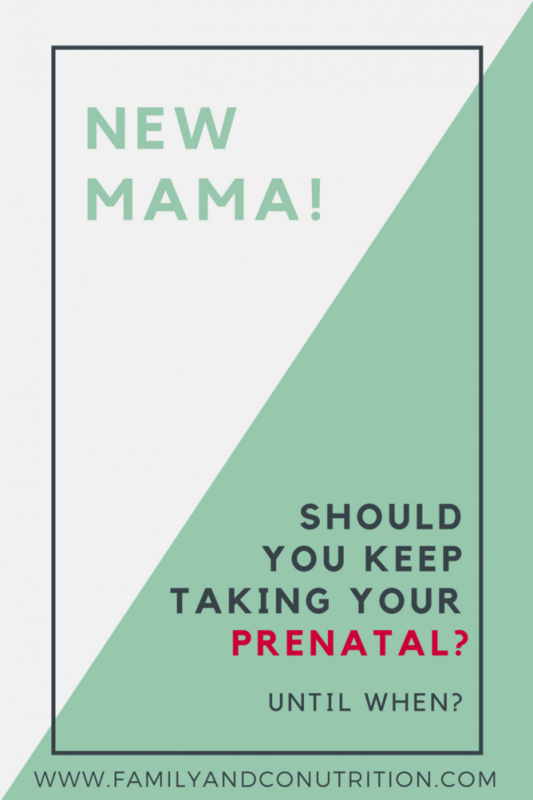 And you might not be there yet, but when you are ready to get pregnant again, it is recommended to start taking a prenatal 3 months before conceiving. Wouldn’t it be great to easily compare what’s in the most popular prenatal vitamins on the market? Subscribe to get your copy of this handy table we’ve prepared for you.